To Initiate Your Search For The Perfect Delaware Nanny, Start Here! We are truly confident we can provide you with the perfect Nanny so we initiate the nanny search at NO cost to you and then it's up to you to decide! We look forward to finding you your perfect Nanny and want to thank you for choosing ABC Nanny Source to conduct your search! In order to begin the process, please help us, help you! Please take the time to fill out the registration form below so we know exactly what you are looking for and how to help. Our team of Placement Counselors will then review your registration form, and the counselor assigned to your family will contact you! You can expect to be reviewing really wonderful candidates specifically interested in your family within 24-48/hours! The placement counselor assigned to your family will be in touch with you immediately to get started!! Consultation with an ABC Placement Counselor who will provide you with the candidates she has been speaking with who are interested in being your Nanny! One Year Guarantee: ABC Nanny Source offers a One-Year guarantee! If you find that you need to replace your Nanny within one year of hire, we will do so for only a small administrative fee of $325. This fee will be waived for 30 days following the payment of the hiring fee or an administrative fee previously paid. Full Time Live Out Nanny: You can anticipate your full time live out Delaware ABC Nanny to work anywhere from 40 to 55 hours per week. Hourly rates often range between $15-$20/hour. The Placement Fee for a full time live out Nanny is 14% of the Nanny's anticipated gross annual salary with a minimum of $3400. Full Time Live In Nanny: You can anticipate your full time live in Delaware ABC Nanny to be on call or on duty between 50 and 60 hours per week, at a weekly salary of anywhere between $700 to $1,000+/week. The Placement Fee for a full time live in Nanny is 14% of the Nanny's anticipated gross annual salary with a minimum of $3400. Part Time Nanny: Your part time Delaware ABC Nanny will work a minimum of 25 hours per week, all the way up to 39 hours per week, at an hourly rate of anywhere from $15 to $20+/hour. 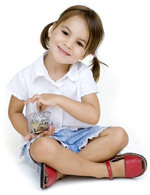 The Placement Fee for a part time Nanny is 16% of the Nanny's anticipated gross annual salary with a minimum $2800. ABC Nanny Source is here to help you! After registering, you can begin reviewing the candidates interested in working for you family within a matter of 24-48/hours! Get started today!